Catriona Sieracki Interview Clip, June 29, 2012. 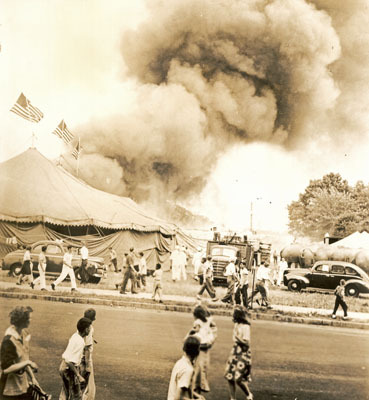 A clip from an interview with Catriona Sieracki, a native of Hartford Connecticut and present at the big top fire of July 6, 1944. The fire was set by an arsonist and was one of the worst disasters in American circus history and caused the deaths of 167 people. Reserved seating chair with fire damage from the Hartford Fire. This chair is referred to in the audio clip.